Miroslav Barnyashev (Bulgarian: Мирослав Барняшев; born December 25, 1984) is a Bulgarian professional wrestler, former powerlifter and rower currently signed to the United States-based professional wrestling promotion WWE, where he performs under the ring name Rusev (Bulgarian: Русев) on the SmackDown brand. Barnyashev is the only Bulgarian to have wrestled for WWE. Rusev has generally played the character of the villainous foreigner to America since his WWE debut. However, after a storyline began in late 2017 in which he declared every day is "Rusev Day", he became one of WWE's most popular wrestlers. Miroslav Barnyashev was born on December 25, 1984, in Plovdiv, which was then in the People's Republic of Bulgaria. He attended a sports school while growing up and competed in rowing and powerlifting as an adult. In the mid-2000s, Barnyashev emigrated from Bulgaria to the United States with the ambition of becoming a professional wrestler. He originally lived in Virginia, before relocating to Torrance, California, where he began training as a wrestler under Gangrel and Rikishi at the Knokx Pro Wrestling Academy. Barnyashev debuted in the San Diego, California-based independent promotion New Wave Pro Wrestling on November 22, 2008, under the ring name Miroslav Makaraov, defeating Aerial Star. In 2010, Barnyashev joined the Santa Maria, California-based independent promotion Vendetta Pro Wrestling (VPW), shortening his ring name to Miroslav. While wrestling for VPW, he was managed by Markus Mac. In September 2010, Barnyashev was signed to a contract by the professional wrestling promotion World Wrestling Entertainment (WWE). He was assigned to WWE's Florida Championship Wrestling (FCW) developmental territory in Tampa, Florida, where he adopted the ring name Alexander Rusev. He wrestled his first televised match on the July 17, 2011, episode of FCW, defeating Mike Dalton while being managed by Raquel Diaz. Shortly after debuting in FCW, Rusev tore both his anterior cruciate ligament and his meniscus and spent six months rehabilitating. Rusev returned to FCW in March 2012 with Nick Rogers as his manager. In the summer of 2012, Rusev suffered a broken neck, temporarily paralyzing his arm. While rehabilitating, Barnyashev travelled to Thailand, where he studied the martial art Muay Thai. In August 2012, WWE rebranded FCW as NXT. After his neck healed, Rusev made his NXT television debut on the May 30, 2013, episode, competing in a battle royal to determine the number one contender to the NXT Championship that was won by Bo Dallas. Rusev's first singles match on NXT came about on August 21, losing to Dolph Ziggler. 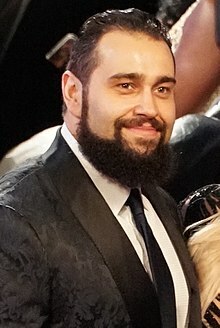 Shortly thereafter, Rusev adopted Sylvester Lefort as his manager and formed a short-lived tag team with Scott Dawson named "The Fighting Legionnaires"; they feuded with the team of Enzo Amore and Colin Cassady. On the October 30 episode of NXT, Rusev ended his affiliation with Lefort by attacking him during a tag team bout. Rusev proceeded to adopt Lana as his "social ambassador", a pairing compared by WWE to Ivan and Ludmilla Drago from the 1985 film Rocky IV. In matches taped before his main roster debut, Rusev defeated main roster wrestlers Kofi Kingston, Xavier Woods, and Sin Cara in singles matches, which aired on NXT in January and February. Rusev continued to appear sporadically on NXT after joining the main roster in April 2014, making his final appearance on July 24, getting disqualified against NXT Champion Adrian Neville in a non-title match. Rusev made his main roster debut at the Royal Rumble. The sixth entrant in the titular match, Rusev was eliminated by the joint effort of four wrestlers. After months of self-promotional videos and speeches by Rusev and his manager Lana, Rusev's return match on the main roster came on the April 7 episode of Raw, where he squashed Zack Ryder. In May, Rusev adopted a Russophillic, anti-American gimmick that saw him announced as having relocated to Russia, and as having been named "Hero of the Russian Federation". This angle brought Barnyashev much legitimate heat in his native Bulgaria. In the same month, his ring name was shortened to simply Rusev. Over the next several months, Rusev feuded with Xavier Woods and R-Truth (whom Rusev defeated at Extreme Rules in a two-on-one handicap match) and Big E (whom he defeated at Payback and at Money in the Bank), Jack Swagger (whom he defeated at Battleground and again at SummerSlam), Mark Henry (whom he defeated at Night of Champions) and Big Show (whom he defeated at Hell in a Cell). Lana dedicated Rusev's string of victories to President of Russia Vladimir Putin, drawing attention from the mainstream press – including The Washington Post and The Daily Beast – and criticism after she was interpreted as having referred to the crash of Malaysia Airlines Flight 17 before Rusev's match at Battleground in an attempt to generate heat. On the October 6 episode of Raw, Rusev and Lana were confronted by The Rock in a surprise appearance, with The Rock driving Rusev from the ring after a verbal exchange. On November 3, Rusev gained his first professional wrestling championship and became the first Bulgarian-born champion in WWE history when he won the United States Championship from Sheamus in a post-Raw match that aired on the WWE Network and proceeded to defeat him in a rematch via count-out. At Survivor Series, Rusev competed in a 10-man Survivor Series match as part of Team Authority but he was eliminated from the match by countout. Rusev and Jack Swagger once again feuded in December, leading to Rusev successfully defending the United States Championship against Swagger at TLC. At the Royal Rumble, Rusev entered the Rumble match at number 15, eliminating six other contestants and placing second overall. At Fastlane, Rusev successfully defended the United States Championship in a bout with John Cena. Rusev lost the United States Championship to Cena in a rematch at WrestleMania 31 after a miscommunication with Lana, ending his reign at 146 days and marking his first pinfall loss on WWE's main roster. It was six minutes of Rusev being punished on live national television for getting engaged to his longtime girlfriend ... [After] the cleanest job Rusev has ever done ... [Summer Rae] cut Vince McMahon's promo for him ... totally castrated [Rusev] ... How they get Rusev back on track as a killer after this segment is beyond me, which may have been the intent. Rusev failed to regain the championship the following month at Extreme Rules in a Russian Chain match; during the match, Lana garnered a positive reaction from the crowd, leading to Rusev banishing her from ringside and causing dissension between the two. Rusev lost to Cena once more at Payback on May 17, 2015 in an "I Quit" match after Lana conceded the match on his behalf. On the post-Payback episode of Raw on May 18, 2015, Rusev ended his affiliation with Lana, who slapped him in response. On the May 25 episode of Raw, Rusev reverted to being billed from Bulgaria and began carrying the flag of Bulgaria to ringside. Later that same evening, Rusev unsuccessfully attempted to reconcile with Lana. Three days later on SmackDown, Rusev suffered a fractured foot in a bout with Ryback, rendering him unable to compete in the Elimination Chamber match for the vacant Intercontinental Championship at Elimination Chamber. Despite his injury, Rusev still appeared on television and made further attempts to reconcile with Lana. Lana then began a storyline relationship with Dolph Ziggler, while Summer Rae began an alliance with Rusev. On the June 29 episode of Raw, Rusev and Rae confronted Lana and Ziggler, leading to a fight between Rae and Lana. On the July 6 episode of Raw, Rusev and Rae once again confronted the couple, which turned out to be a ruse, as Rusev viciously attacked Ziggler after hitting him with his crutch and removed his ankle brace, revealing that his foot injury had healed. The attack resulted in Ziggler sustaining a bruised trachea in storyline and out of action indefinitely. Rusev made his in-ring return on the following SmackDown, wrestling in shoes to avoid further foot injury, defeating Fandango. On the July 13 episode of Raw, Rusev answered John Cena's United States Championship open challenge. Rusev was then interrupted by both Kevin Owens and Cesaro, who also demanded a shot at the title. This resulted in a triple threat match, where the winner would face Cena, which Rusev won after pinning Cesaro, as Owens had left the match early on. Afterwards, Rusev defeated Cena by disqualification, when Owens assaulted Rusev. On the July 16 episode of SmackDown, Rusev suffered his second loss by pinfall during his tenure on the WWE main roster when he was defeated by Cesaro in a singles match. On the August 17 episode of Raw, Ziggler returned and attacked Rusev. This altercation prompted a match between Rusev and Ziggler at SummerSlam, which ended in a double countout due to interference from Lana and Rae, and after the match, Rusev and Rae brawled with Ziggler and Lana. On the October 5 episode of Raw, Rae proposed to Rusev in the storyline, but said he would not marry her until he had won another championship. On October 11, TMZ reported that Rusev had become engaged to Lana in real life. Lana then confirmed the engagement and it began being used in the storyline on television, which resulted in Rae breaking up with him on the October 12 episode of Raw. The entire storyline circulating around the break-up of Rusev and Lana received extremely negative reviews, with many claiming the storyline damaged Rusev's gimmick. On the October 31 episode of Main Event, Rusev injured his bicep in a match with Neville, resulting in Neville winning the match via referee stoppage and Rusev being out of action. Rusev returned on the November 23 episode of Raw, when he attacked Roman Reigns, and lost to him by disqualification after Sheamus and King Barrett attacked Reigns. A week later, on November 30 episode of Raw, Lana returned to the WWE, once again as a villainess, and reconciled with Rusev, during a Miz TV segment, and later in the same night, the two joined Sheamus' new stable The League of Nations. Throughout December, Rusev started a feud with Ryback, with Lana faking injuries to distract Ryback and help Rusev gain advantage. At TLC, Rusev defeated Ryback by technical submission to end the feud. Also in November, Rusev joined forces with Sheamus, King Barrett and Alberto Del Rio forming The League of Nations. The faction aligned themselves with Mr. McMahon and would continue to target WWE World Heavyweight Champion Roman Reigns. Rusev would enter the Royal Rumble match at the No. 2 spot, but he would be eliminated by Roman Reigns in one and a half minutes. On the March 14 episode of Raw, Rusev and Del Rio failed to win the WWE Tag Team Championship from The New Day. At WrestleMania 32, The League of Nations defeated The New Day, but after the match, The League of Nations was attacked by Mick Foley, Shawn Michaels and Stone Cold Steve Austin. Following WrestleMania 32, on the April 4, episode of Raw, League of Nations members Sheamus and King Barrett were part of a losing effort against The New Day for the WWE Tag Team Championship after Barrett was pinned by Kofi Kingston, and following the match, Barrett was exiled from the group being called the "weak link", but moments after, The Wyatt Family went on to attack the remaining members of The League of Nations. On the April 28 episode of SmackDown, Rusev walked out on Sheamus after Del Rio walked out the both of them, thus disbanding The League of Nations. On the May 2 episode of Raw, Rusev won a battle royal by last eliminating Zack Ryder to become the No. 1 contender for the United States Championship, which he won for the second time by defeating Kalisto at Extreme Rules via submission. Rusev defeated him in a rematch on the following week's SmackDown, after which he was confronted by Titus O'Neil, whom Rusev defeated at Money in the Bank to successfully retain the title. Rusev followed this with a successful third title defense against Cesaro and defeated O'Neil on the July 4 episode of Raw to retain the title. Rusev was then challenged by Zack Ryder, whom he defeated at Battleground for another successful title defense. In the 2016 WWE draft, Rusev, along with Lana, was drafted to Raw, taking the United States Championship with him. On the August 1 episode of Raw, after Rusev defeated Mark Henry to retain the title, Roman Reigns came out to confront Rusev. The following week on Raw, Reigns interrupted Rusev and Lana's wedding re-enactment, and issued a challenge to Rusev for the title. Rusev declined, and the two brawled, causing Lana to fall into a wedding cake. Backstage, Mick Foley told an angered Lana and Rusev that Rusev would defend the United States title against Reigns at SummerSlam. Later that night, Rusev successfully defended the title in an impromptu match against Cesaro, who felt that he should also have a shot at the title. At SummerSlam, the match did not start after Rusev attacked Reigns before the bell rung and the two brawled outside of the ring, with Rusev suffering kayfabe injured ribs. After costing Reigns the opportunity of becoming a No. 1 contender for the Universal Championship, Rusev defended the United States Championship against Reigns in a match at Clash of Champions, which he lost, ending his reign at 126 days. Rusev would then get his rematch at the Hell in a Cell pay-per-view in a Hell in a Cell match, which he would be unsuccessful. On the November 21 episode of Raw, after being locked out of his locker room, Enzo Amore would run into Lana in the hallway before being angrily confronted by Rusev. Rusev would challenge Amore to a match later that night, quickly defeating him. The following week on Raw, Amore would defeat Rusev by disqualification. At Roadblock: End of the Line, Rusev would face Amore's tag partner, Big Cass, defeating him by countout. The following night on Raw, Rusev would face Cass again, this time defeating him by disqualification. That same night, Amore would have to attend sensitivity training from the incident on the November 21 episode of Raw. At the training, Amore would be attacked by Rusev and his new ally, Jinder Mahal. On the January 2, 2017 episode of Raw, Rusev teamed with Mahal in a 2-on-1 handicap match, defeating Big Cass. At Royal Rumble, Rusev would enter the Rumble match at number eighteen, lasting over 20 minutes before being eliminated by Goldberg. On the February 27 episode of Raw, Rusev and Mahal began to show tension after Rusev inadvertently distracted Mahal, causing the two to lose to The New Day. At Fastlane, general manager Mick Foley placed Rusev and Mahal in singles matches that night after Mahal revealed his desire to return to singles competition. Rusev and Mahal both lost their respective matches against Big Show and Cesaro. Both Rusev and Lana disappeared from television following Rusev requiring surgery for an injury. On April 11, Rusev was moved to SmackDown brand as part of the Superstar Shake-up. On the April 25 episode of SmackDown Live, Rusev made his first appearance on WWE programming since Fastlane, appearing via satellite, and declared that he would not make his debut on SmackDown unless he was given a WWE Championship match at the Money in the Bank pay-per-view on June 18. He was not granted his request, but on the July 4 episode of SmackDown Live, he made his first appearance for the brand and confronted the returning John Cena, setting up a flag match for Battleground, which he lost. In August, he started a feud with Randy Orton and was defeated by Orton at SummerSlam in 10 seconds. He got his revenge on the following episode of SmackDown Live, and was given the key to his legitimate hometown of Plovdiv. The mayor granted him the key to the city, as witnessed by Aiden English. However, both English and Rusev were attacked by Orton. That day was stated as "Rusev Day" and in following SmackDown Live episodes, Rusev would state that every day was "Rusev Day", with the crowd chanting its name whenever Rusev and English are present. At Hell in a Cell, Rusev lost to Orton again, thus ending their feud. Since then, Rusev and English wrestled as a tag team, participating in a fatal four-way tag team match for the SmackDown Tag Team Championship at Clash of Champions also involving The New Day, Chad Gable and Shelton Benjamin and the champions The Usos. They were unsuccessful in winning. On the March 27, 2018 episode of SmackDown Live, Rusev teamed with Jinder Mahal to defeat Bobby Roode and Randy Orton, subsequently adding him to the United States Championship match at WrestleMania 34. At the event, Rusev was pinned by Mahal, losing the match. At the Greatest Royal Rumble event, he faced The Undertaker in a Casket Match, but he lost. On the May 8 episode of SmackDown Live, Rusev defeated Daniel Bryan to qualify for the Men's Money in the Bank ladder match, which was won by Braun Strowman. On the following episode of SmackDown, he won a gauntlet match to become the number one contender for AJ Styles' WWE Championship at Extreme Rules. At the event, he was defeated by Styles. In July, Rusev Day started a feud with Andrade "Cien" Almas and Zelina Vega, thus turning them face in the process for the first time in his career. Rusev and Lana lost a mixed tag team match to Almas and Vega at SummerSlam but defeated them in a rematch on the August 21 episode of SmackDown Live. On the September 4 episode of SmackDown Live, Rusev and English defeated The Usos and Sanity in a triple threat match to face The Bar, whom they defeated on the following week's SmackDown Live to earn a SmackDown Tag Team Championship match against The New Day at Hell in a Cell, which they lost. On the September 18 episode of SmackDown Live, Rusev lost to Shinsuke Nakamura for the United States Championship after a distraction by English, after which English turned on Rusev by attacking him, thus ending their alliance. On the October 23 episode of SmackDown Live, Rusev defeated English, ending their feud. After failing to win the United States Championship from Nakamura at Crown Jewel, Rusev finally managed to capture the United States Championship for a third time in his career on the December 25 episode of SmackDown. On January 27, 2019, he lost the title back to Nakamura on the Royal Rumble pre-show. Two days later on SmackDown Live, Rusev confronted R-Truth, who had just defeated Nakamura for the United States Championship, and pushed him into defending his newly-won title against him, but Truth retained his title. After the match, Nakamura attacked Truth, and Rusev joined him in attacking Truth, thus turning heel again in the process. Barnyashev, along with other VPW wrestlers, appeared in the music video for the song "The Whole F'n Show" by Kushinator (the entrance music of wrestler Rob Van Dam). As Rusev, he made his video game debut as a playable character in WWE 2K15 and has his own path in the "Who Got NXT" mode. He has appeared in subsequent games in the 2K series, WWE 2K16, WWE 2K17, WWE 2K18, and WWE 2K19. In 2016, Barnyashev appears as himself in Season 6 of the reality series, Total Divas, as well as the WWE film Countdown and in the animated film Scooby-Doo! and WWE: Curse of the Speed Demon. Barnyashev married Catherine Perry, a fellow professional wrestler and manager who performs for WWE under the ring name Lana, in July 2016. They reside in Nashville, Tennessee. ^ a b c d e f Byer, Matthew (October 21, 2011). "Gangrel still a force at 42". Slam! Sports. Canadian Online Explorer. Retrieved September 14, 2013. ^ a b c d e "World Wrestling Entertainment Signs 'The Bashing Bulgarian'". Novinite.com (Sofia News Agency). One Click Media Group. September 30, 2010. Retrieved September 15, 2013. ^ a b c d e "Rusev". WWE. 2013. Retrieved January 18, 2014. ^ a b c d e f g h i j Saxton, Byron (August 29, 2013). "Alexander Rusev: NXT's brewing storm". WWE. Retrieved September 14, 2013. ^ WWE (May 8, 2014). "Rusev Entrance Video". Retrieved July 14, 2016 – via YouTube. ^ a b "Alexander Rusev". Gerweck.net. Retrieved January 26, 2014. ^ Esnaashari, Farbod. "Rusev aims to break the mold for foreign WWE superstars". ESPN. Retrieved 12 April 2018. ^ Lianos, Konstantinos. "WWE news: Rusev teases blockbuster WrestleMania 34 match against celebrity opponent". The Daily Express. Retrieved 12 April 2018. ^ Paddock, Matty. "Meet Rusev: the WWE star delighted to have broken free of some stereotypical shackles". The Independent. Retrieved 12 April 2018. ^ Lana (December 25, 2015). "Lana". Twitter. Retrieved December 27, 2016. #HappyBirthday to my best friend @RusevBUL 31 years ago the world became a better place. ^ "Vendetta Pro Wrestling results – Winter Wonder Slam (Jan. 2010)". Vendetta Pro Wrestling. Retrieved December 30, 2013. ^ Trionfo, Richard (July 17, 2011). "Florida Championship Wrestling television report". PWInsider. Retrieved September 21, 2013. ^ Pendry, Ryan (July 9, 2011). "7/8 FCW results in Gainesville, Fla". Pro Wrestling Torch. Retrieved September 15, 2013. ^ Parry, Josh (March 4, 2012). "3/2 FCW results Kissimmee, Fla". Pro Wrestling Torch. Retrieved September 15, 2013. Rusev and Rogers are a very impressive tandem. Rusev, the big man, stomped out to the ring as Rogers joined him in jeans and a bedazzled jacket, loudly blowing a whistle. ^ "WWE News: FCW name being phased out". Wrestling Observer Newsletter. Archived from the original on August 17, 2012. Retrieved August 14, 2012. ^ Witner, Emerson (May 30, 2013). "WWE NXT TV report". Wrestling Observer Newsletter. Archived from the original on September 23, 2013. Retrieved September 21, 2013. ^ James, Justin (September 5, 2013). "James's WWE NXT Results 8/21 & 8/28 & 9/4". Pro Wrestling Torch. Retrieved September 14, 2013. ^ Saxton, Byron (September 12, 2013). "Making money: Sylvester Lefort's lucrative path to NXT". WWE. Retrieved September 15, 2013. ^ James, Justin (September 13, 2013). "James's WWE NXT Report 9/11". Pro Wrestling Torch. Retrieved September 15, 2013. ^ James, Justin (November 21, 2013). "James's WWE NXT Report 11/20". Pro Wrestling Torch. Retrieved November 21, 2013. The Mysterious Blonde announces Alexander Rusev. Apparently, she is "Lana" his social ambassador. ^ Saxton, Byron (December 4, 2013). "'The NXT Champ Report': Bo Dallas evaluates five of NXT's rising stars". WWE. Retrieved January 3, 2014. Alexander Rusev and Lana remind me of that duo from "Rocky IV." ^ "Ongoing NXT Spoilers: Updated 11:21 pm ET". PWInsider. November 11, 2013. Retrieved October 14, 2014. ^ "WWE NXT Spoilers from Full Sail University". PWInsider. January 10, 2014. Retrieved October 14, 2014. ^ James, Justin. "James's WWE NXT results 1/1 – Week 79: Zayn/Generico in 2/3 Falls match, Kingston, Natalya, Overall Reax". Pro Wrestling Torch. Retrieved January 3, 2014. ^ James, Justin (January 9, 2014). "James's WWE NXT Report 1/8". Pro Wrestling Torch. Retrieved January 26, 2014. ^ James, Justin. "James's WWE NXT report 2/5 – Week 84: Triple H makes an announcement, Neville/Pac vs. Graves, Sin Cara, Kidd, Rusev, Emma, more; Overall Reax". Pro Wrestling Torch. Retrieved March 28, 2014. ^ James, Justin (July 25, 2014). "James's WWE NXT Report 7/24". Pro Wrestling Torch. Retrieved July 27, 2014. ^ Caldwell, James (January 26, 2014). "Rumble PPV news: Batista, undercard losers not included, this year's surprise entries, Bray's big night, The Crowd". Pro Wrestling Torch. Retrieved January 27, 2014. ^ Murphy, Ryan; Linder, Zach. "Full list of Royal Rumble Match participants and eliminations". WWE. Archived from the original on March 21, 2014. Retrieved January 27, 2014. ^ Parks, Greg. "Parks's WWE SmackDown report 1/31: Ongoing "virtual time" coverage of Friday show, including The Shield vs. Daniel Bryan & Sheamus & Rey Mysterio". Pro Wrestling Torch. Retrieved March 28, 2014. ^ Parks, Greg. "Parks's WWE SmackDown report 2/7: Ongoing "virtual time" coverage of the Friday night show, including Orton vs. Christian". Pro Wrestling Torch. Retrieved March 28, 2014. ^ Caldwell, James. "Caldwell's WWE Raw results 3/10: Complete "virtual-time" coverage of live Raw – Bryan "hi-jacks" Raw, Taker & Hogan back on TV, Cena vs. Wyatts feud continues". Pro Wrestling Torch. Retrieved March 28, 2014. ^ Caldwell, James (April 7, 2014). "Caldwell's WWE Raw results 4/7". Pro Wrestling Torch. Retrieved June 30, 2014. ^ a b Teeman, Tim (May 14, 2014). "Putin Vs. Obama—In Spandex: Wrestling's New Cold War". The Daily Beast. IAC/InterActiveCorp. Retrieved May 25, 2014. ^ Seife, Andy (May 4, 2014). "Alexander Rusev def. R-Truth & Xavier Woods (2-on-1 Handicap Match)". WWE. Retrieved May 5, 2014. ^ Payne, Marissa (May 5, 2014). "Vladimir Putin makes his WWE debut at 'Extreme Rules'". The Washington Post. Retrieved May 6, 2014. ^ Benigno, Anthony (June 2, 2014). "Raw results: The Shield shatters and Wyatts rebound as Money in the Bank takes shape". WWE. Retrieved June 12, 2014. ^ Benigno, Anthony (May 5, 2014). "Raw results: Evolution adapts, Adam Rose celebrates and Sheamus triumphs". WWE. Retrieved May 6, 2014. ^ Caldwell, James (June 24, 2014). "Caldwell's WWE Raw Results 6/23". Pro Wrestling Torch. Retrieved June 30, 2014. ^ Caldwell, James (June 1, 2014). "Caldwell's WWE Payback PPV Results 6/1". Pro Wrestling Torch. Retrieved June 30, 2014. ^ Caldwell, James (June 29, 2014). "Caldwell's WWE MITB PPV Results 6/29". Pro Wrestling Torch. Retrieved June 30, 2014. ^ Caldwell, James (July 20, 2014). "Caldwell's WWE Battleground PPV Results 7/20". Pro Wrestling Torch. Retrieved July 24, 2014. ^ Caldwell, James (August 17, 2014). "Caldwell's WWE SummerSlam PPV Results 8/17: Complete "virtual-time" coverage of Cena vs. Lesnar". Pro Wrestling Torch. Retrieved August 18, 2014. ^ Caldwell, James (September 21, 2014). "Caldwell's WWE NoC PPV Report 9/21". Pro Wrestling Torch. Retrieved September 21, 2014. ^ "Rusev def. Big Show via submission". ^ Payne, Marissa (July 21, 2014). "WWE alludes to Malaysian Airlines Flight 17 during 'Battleground' and it did not go over so well". The Washington Post. Katharine Weymouth. Retrieved July 23, 2014. ^ Caldwell, James. "Raw News: Rock surprise return, Reigns non-live return, Edge back on TV, Lesnar MIA, next week's Raw guest star, more". Pro Wrestling Torch. Retrieved October 7, 2014. ^ Caldwell, James. "Raw News: Rusev captures U.S. Title on WWE Network, Vince McMahon returns, Orton gone from Authority?, no Cena, IC Title match, Xavier Woods re-packaged, Ambrose-Wyatt, more". Pro Wrestling Torch. Retrieved November 5, 2014. ^ Kapur, Bob (November 24, 2014). "WWE Survivor Series: The Authority feels the Sting of defeat". Slam! Sports. Canadian Online Explorer. Retrieved November 24, 2014. Rusev crashed hard through the table. Ziggler got back into the ring, but even with help from HHH's minions, Rusev wasn't able to get there before the ref counted to 10 and he was counted out. ^ Caldwell, James (January 25, 2015). "Caldwell;s Royal Rumble PPV Report 1/25". Pro Wrestling Torch. Retrieved January 25, 2015. ^ Clapp, John. "WWE United States Champion Rusev vs. John cena". WWE. Retrieved January 27, 2015. ^ Caldwell, James (February 22, 2015). "Caldwell's WWE Fast Lane PPV results 2/22: Ongoing "virtual-time" coverage of Bryan vs. Reigns, Cena vs. Rusev, Sting-Hunter confrontation, final PPV before WM31". Pro Wrestling Torch. Retrieved February 22, 2015. ^ Caldwell, James (March 29, 2015). "CALDWELL'S WM31 PPV RESULTS 3/29: Ongoing "virtual-time" coverage of WWE World Title match, Taker's return, Sting vs. Triple H, Cena vs. Rusev, more big matches". Pro Wrestling Torch. Retrieved March 29, 2015. ^ Hamlin, Jeff. "WWE Raw Live Results 10-12". Wrestling Observer Newsletter. Retrieved 21 October 2015. ^ Caldwell, James (April 26, 2015). "CALDWELL'S EXTREME RULES PPV REPORT 4/26: Ongoing "virtual-time" coverage of live PPV - Rollins vs. Orton steel cage, Cena vs. Rusev, Last Man Standing, more". Pro Wrestling Torch. Retrieved April 26, 2015. ^ Melok, Bobby. "United States Champion John Cena def. Rusev ("I Quit" Match)". WWE. Retrieved 17 May 2015. ^ Caldwell, James (May 18, 2015). "CALDWELL'S WWE RAW RESULTS 5/18: Ongoing "virtual-time" coverage of live Raw - Payback PPV fall-out, three title matches advertised, more". Pro Wrestling Torch. Retrieved May 18, 2015. ^ Caldwell, James (May 24, 2015). "Caldwell's WWE Raw Results 5/25". Pro Wrestling Torch. Retrieved May 26, 2015. ^ "Rusev not medically cleared to compete tonight at Elimination Chamber 2015". WWE. May 31, 2015. Retrieved May 31, 2015. ^ Benigno, Anthony (June 29, 2015). "Dolph Ziggler and Lana went public as a couple". WWE. Retrieved June 29, 2015. ^ Benigno, Anthony (July 6, 2015). "Rusev attacked Dolph Ziggler". WWE. Retrieved July 9, 2015. ^ "Raw: July 6, 2015". Retrieved July 14, 2016. ^ Doughman, Sean (July 7, 2015). "WWE NEWS: Smackdown SPOILERS 7/9 - full results for Thursday's show". Pro Wrestling Torch. Retrieved July 9, 2015. ^ Caldwell, James (July 13, 2015). "CALDWELL'S WWE RAW RESULTS 7/13: Ongoing "virtual-time" coverage of live Raw - Brock Smash, final Battleground PPV hype, more". Pro Wrestling Torch. Retrieved July 13, 2015. ^ Burdick, Michael (July 16, 2015). "Cesaro def. Rusev". WWE.com. Retrieved July 16, 2015. ^ Caldwell, James (August 17, 2015). "CALDWELL'S WWE RAW RESULTS 8/17: Ongoing "virtual-time" coverage of live Raw - Final Summerslam hype, Lesnar & Undertaker, Cena returns from injury, more". Pro Wrestling Torch. Retrieved August 17, 2015. ^ Caldwell, James (October 5, 2015). "CALDWELL'S WWE RAW RESULTS 10/5: Complete "virtual-time" coverage of live Raw - Lesnar returns, Cena's Open Challenge, more". Pro Wrestling Torch. Retrieved October 6, 2015. ^ "WWE Stars Lana and Rusev: in Russia we buy house together ... before marriage". TMZ. Time Warner. March 1, 2015. Retrieved March 1, 2015. ^ "WWE.com Exclusive: Lana confirms engagement to Rusev". WWE. October 12, 2015. Retrieved October 14, 2015. ^ Caldwell, James (October 12, 2015). "CALDWELL'S WWE RAW RESULTS 10/12: Complete "virtual-time" coverage of live Chicago Raw - Cena's U.S. Title Open Challenge, WWE Champ loses in main event, more". Pro Wrestling Torch. Retrieved October 14, 2015. ^ "Everything That's Wrong With The Dolph Ziggler/Lana/Rusev Storyline". The Armbar Express. Retrieved 2016-01-11. ^ "Rusev injured during WWE Main Event tapings". WWE. October 29, 2015. Retrieved October 29, 2015. ^ Caldwell, James (November 23, 2015). "11/23 WWE Raw Results – CALDWELL'S Complete Live Report". Pro Wrestling Torch. Retrieved November 24, 2015. ^ a b Trionfo, Richard (November 30, 2015). "WWE RAW REPORT: A NEW GROUP IS FORMED, IS THE QUEEN OF THE JUNGLE SHOWING HER TRUE STRIPES?, ARE THE NEW DAY TURNING INTO J&J SECURITY FOR SHEAMUS?, A FEW RETURNS, AND MORE". PWInsider. Retrieved November 30, 2015. ^ Caldwell, James (December 7, 2015). "12/7 WWE Raw Results – CALDWELL'S Complete live report". PWTorch. Retrieved December 7, 2015. ^ Johnson, Mike (December 13, 2015). "COMPLETE WWE TLC PPV COVERAGE". PWInsider. Retrieved December 13, 2015. ^ Meltzer, Dave (January 24, 2016). "WWE Royal Rumble 2016 live results: 30 men battle for the WWE World Championship". Wrestling Observer Newsletter. Retrieved January 24, 2016. ^ Burdick, Michael. "The New Day def. Alberto Del Rio & Rusev". WWE.com. Retrieved March 14, 2016. ^ "Del Rio says League of Nations will be ending soon, Bray's injury sealed future". PWTorch.com. Retrieved April 26, 2016. ^ "United States Champion Kalisto, Sami Zayn & Cesaro def. Sheamus, Rusev & Alberto Del Rio by Count-out". WWE.com. Retrieved April 28, 2016. ^ "WWE Raw results, April 4, 2016: Who emerged from Fatal 4-Way as the No. 1 contender?". www.wwe.com. Retrieved May 2, 2016. ^ Parks, Greg. "5/26 WWE Smackdown Results – Parks's Complete Report". Pro Wrestling Torch. Retrieved May 27, 2016. ^ Parks, Chris. "6/30 WWE Smackdown – Parks's Complete, Real-Time Report". Pro Wrestling Torch. Retrieved July 4, 2016. ^ Caldwell, James. "7/4 WWE Raw Results – CALDWELL'S Complete Live TV Report". Pro Wrestling Torch. Retrieved July 4, 2016. ^ Parks, Greg (July 7, 2016). "7/7 WWE Smackdown – Parks's Complete, Real-Time Report". Pro Wrestling Torch. Retrieved July 24, 2016. ^ "7/11 WWE Raw Results – CALDWELL'S Complete TV Report". PWTorch.com. Retrieved July 13, 2016. ^ Caldwell, James. "9/25 WWE Clash PPV Results – CALDWELL'S Complete Report". Pro Wrestling Torch. Retrieved September 25, 2016. ^ "WWE Hell in a Cell 2016 results". WWE. Retrieved November 1, 2016. ^ "WWE RAW Results – 2/27/17 (Seth Rollins returns, Goldberg, Fastlane)". WrestleView. Retrieved 8 March 2017. ^ "WWE Fastlane full results: Goldberg wins the Universal Championship". Fox Sports. Retrieved 8 March 2017. ^ "Rusev coming to SmackDown Live but without Lana? (UPDATED)". Cageside Seats. 2017-04-11. Retrieved 2017-04-12. ^ Burdick, Michael. "Rusev & Aiden English def. The New Day". WWE.com. Retrieved December 5, 2017. ^ Benigno, Anthony. "SmackDown Tag Team Champions The Usos def. The New Day, Chad Gable & Shelton Benjamin and Rusev & Aiden English (Fatal 4-Way Match)". WWE.com. Retrieved December 17, 2017. ^ Tedesco, Mike (March 27, 2018). "WWE Smackdown Results – 3/27/18 (Daniel Bryan fallout, WrestleMania two weeks away)". Wrestleview. Retrieved April 10, 2018. ^ Benigno, Anthony. "United States Champion Randy Orton vs. Bobby Roode vs. Jinder Mahal vs. Rusev (Fatal 4-Way Match)". WWE. Retrieved March 20, 2018. ^ Powell, Jason. "Undertaker returning for a casket match at the Greatest Royal Rumble". Pro Wreslting Dot Net. Retrieved April 11, 2018. ^ Anthony Benigno (July 15, 2018). "WWE Champion AJ Styles def. Rusev". WWE. Retrieved 23 September 2018. ^ Ryan Pappolla (August 19, 2018). "Andrade "Cien" Almas & Zelina Vega def. Rusev & Lana". WWE. Retrieved 23 September 2018. ^ "WWE SmackDown LIVE results, Aug. 21, 2018: It's new champs, yes it is!". WWE. August 21, 2018. Retrieved 23 September 2018. ^ "WWE SmackDown LIVE results, Sept. 4, 2018: Daniel Bryan & Brie Bella send a painful message to Miz & Maryse". WWE. September 4, 2018. Retrieved 23 September 2018. ^ "WWE SmackDown LIVE results, Sept. 11, 2018: Brie and Maryse's one-on-one battle quickly became an all-out melee". WWE. September 11, 2018. Retrieved 23 September 2018. ^ Anthony Benigno (September 16, 2018). "SmackDown Tag Team Champions The New Day def. Rusev Day (Kickoff Match)". WWE. Retrieved 23 September 2018. ^ Pappolla, Ryan. "Rusev def. Aiden English". WWE.com. Retrieved October 23, 2018. ^ Wortman, James. "United States Champion Shinsuke Nakamura def. Rusev". WWE. Retrieved November 2, 2018. ^ Powell, Jason. "Powell's WWE Smackdown Live TV Review: Shinsuke Nakamura vs. Rusev for the U.S. Title, Samoa Joe vs. Jeff Hardy, Andrade Almas vs. Mustafa Ali, Miz TV with Shane McMahon". Pro Wrestling Dot Net. Retrieved December 25, 2018. ^ Wortman, James. "Shinsuke Nakamura def. Rusev to become the new United States Champion (Kickoff Match)". WWE. Retrieved January 27, 2019. ^ Keller, Wade (January 29, 2019). "1/29 WWE Smackdown Results: Keller's report on Royal Rumble fallout, Becky Lynch comes out after Ronda Rousey confrontation at Raw, Bryan, Miz & Shane, more". Pro Wrestling Torch. Retrieved February 10, 2019. ^ "Vendetta Pro superstars appear in Rob Van Dam's Theme Song Video by Kushinator". Vendetta Pro Wrestling. October 27, 2010. Retrieved September 21, 2013. ^ Sirani, Jordan (October 24, 2014). "WWE 2K15 who got NXT mode announced and detailed". IGN. Retrieved December 6, 2014. ^ Johnson, Mike (October 11, 2015). "WWE STARS ENGAGED". PWInsider. Retrieved October 12, 2015. ^ "Rusev and Lana get married in Malibu". WWE. July 29, 2016. Retrieved July 30, 2016. ^ Caldwell, James (March 1, 2015). "Rusev & Lana's relationship status revealed via mega-purchase". Pro Wrestling Torch. Retrieved March 2, 2015. ^ "Most Improved Wrestler of the Year". Pro Wrestling Illustrated. 36 (2): 16–17. 2015. ^ "Pro Wrestling Illustrated (PWI) 500 for 2015". Pro Wrestling Illustrated. Internet Wrestling Database. Retrieved October 5, 2015. ^ Alvarez, Bryan (March 15, 2018). "WOR: 2017 WRESTLING OBSERVER NEWSLETTER AWARDS DISCUSSION AND MORE!". Wrestling Observer Newsletter. Retrieved March 15, 2018. ^ "Rusev's first United States Championship reign". WWE. Archived from the original on November 7, 2014. Retrieved November 4, 2014. ^ Laboon, Jeff (December 8, 2014). "2014 Slammy Award winners". WWE. Retrieved April 28, 2018. Wikimedia Commons has media related to Rusev. This page was last edited on 1 April 2019, at 14:07 (UTC).